Practicing Forensic Criminology draws on examples from actual court cases and expert witness reports and testimony to demonstrate the merits and uses of substantive criminological knowledge in the applied setting of civil law and the courts. 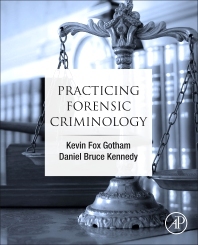 Throughout the book, the authors provide a highly readable, informative discussion of how forensic criminologists can apply their research and teaching skills to assist judges and juries in rendering legal decisions. Engaging and lively, the chapters include excerpts from forensic criminological investigations, in-depth discussions of the methodological and analytical bases of these investigations, and important lessons learned from real litigation cases. Case examples are drawn from the forensic realms of premises liability, administrative negligence, workplace violence, wrongful conviction litigation, and litigation involving police departments and corrections facilities. Well referenced and thoroughly researched, Practicing Forensic Criminology serves as an introduction to the vast and heterogeneous field of forensic social science that is rapidly changing and expanding. This unique and original book guides readers through the research work of expert witnesses working as consultants, researchers, and crime analysts and investigators. Offering expert criminological insights into litigation cases, the chapters reveal how forensic social science research can be an effective mechanism for reaching beyond the academy to influence public policy reform and legal proceedings. Practicing Forensic Criminology will appeal to a diverse audience, including social scientists, criminal justice students and researchers, expert witnesses, attorneys, judges, and students of judicial proceedings seeking to understand the value and impact of criminology in the civil court system. Kevin Fox Gotham is professor of sociology, former NSF program director, and associate dean in the School of Liberal Arts at Tulane University. He is an internationally recognized expert in real estate and housing policy, political economy of tourism, and emergency management. He has authored three books, one edited volume, and published over 100 peer-reviewed articles and book chapters. Professor Gotham has won several professional awards for research excellence, and his work has been featured and quoted in many media outlets. Dr. Gotham serves as a social science expert in complex litigation. Daniel B. Kennedy is Emeritus Professor of Criminal Justice and Security Administration at the University of Detroit Mercy. Currently, he is Principal Consultant at Forensic Criminology Associates and an Adjunct at Oakland University in Rochester, Michigan. A former probation officer and police academy director, Dr. Kennedy has authored numerous peer-reviewed articles and book chapters. He has testified at trial on police, corrections, and private security issues throughout the U.S. at both state and federal levels.